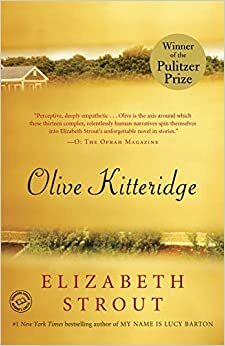 Olive Kitteridge is an interesting contrast to the last book I read. Like The Underground Railroad, it’s an award-winning book, picking up the Pulitzer Prize for Fiction in 2009. But whereas Colson Whitehead used fiction to tackle the issue of slavery in the US and its ongoing legacy, Elizabeth Strout’s focus is on the inner life of one woman, a woman whose brusque external shell hides a more complex and sensitive being. ‘No one’s cute who can’t stand up straight,’ Olive said. She is abrupt, and forceful. ‘Not keen on it,’ Olive said, when he suggested they have the young couple to dinner. Henry let it drop. He wanted to put his arms around her, but she had a darkness that seemed to stand beside her like an acquaintance that would not go away. He told her the Thibodeaus were coming for supper. ‘It’s only right,’ he said. Even now as she has aged into retirement, former students in the small community of Crosby, Maine are sometimes a little afraid of her. She has a tough, no-nonsense, don’t-feel-sorry-for-yourself manner. Stuff happens to everyone she says to Henry, and you just have to deal with it. Through the thirteen vignettes that make up this novel, we see that her managerial style and tyrannical demands have alienated her from her son Christopher. But, like most of us, Olive learns from life. At first she is bewildered when Christopher cuts loose and hives off to California with a wife that Olive doesn’t like. For a long time she can’t bring herself to walk past the house that she and Henry built for Christopher to live in. Privately, she grieves for the life she had expected with a son and the eventual grandchildren living close by, and she keeps to herself the news that the wife dumped him soon after they arrived in California and yet he didn’t want to come home. It’s not until late in the book when she makes a visit to Christopher’s chaotic home in New York that they have an overt row and she begins to understand why she wasn’t invited to their wedding. Still, the reader can’t help but feel for her when Christopher doesn’t bother to ring her about her grandchild’s milestones. She learns too, that the husband who sometimes exasperated her, had been chafed by her bossiness but had never told her so. Yet few readers will be unmoved by her stoic visits to his nursing home when he has a stroke, and by the aching loneliness she feels when he is gone. The real skill of this undemanding portrait of a complex woman is the way in which the reader is forced to withhold judgement on her. However I felt that the novel was marred by the ending, not because I felt that Olive could not have mellowed, but because the statistics show that most women widowed late in life remain alone rather than re-partnered. It would have been more honest, I think, to depict Olive learning to adjust to that reality. PS That cover design! What were they thinking??? It’s definitely both an interesting and a well written (literary) portrait. I saw the mini series a while ago, and then listened to the audio book last month. Retired, strict teachers are interesting people! There was a mini series? I missed that! X-Mrs L got the video from her hole in the wall video machine. You could ask the Resident Judge, I recommended it to her too. I’ve found it, and ordered it. It will be interesting to see how it’s rendered on film. I so love this novel, although my favourite novel by Elizabeth Strout is Abide with Me. Still, Olive Kitteridge is pretty damn good for a portrait of a cranky middle-aged woman struggling with life. I also loved this book, and her latest book Lucy Barton is pretty good too. I agree the cover design is shocking, nothing at all related to the story at all. This is a story about a woman discovering herself. The first publication had a much better cover design. Yes, some of the designs I’ve seen for other editions are really appropriate. This one tells us that no one at the publishing house had read the book. I was given this book a couple of years ago but haven’t read it yet. My cover is MUCH better than this one! I’ve heard such good things about the book … I think I need a month of being in bed not very sick to get through some of these books I really want to read. I read this years ago and thought it brilliant. The mini series is also brilliant. I’m currently reading and enjoying Lucy Barton and read The Burgess Boys last year. I have Amy and Isabelle on my tbr. Olive Kitteridge turned me into a bit of a Strout fan. I’ll let you know what I think of the mini series, I’ve ordered it today. Great review. Sounds interesting, even if the ending doesn’t quite pan out. Thanks:) Oh yes, it’s a satisfying book; the ending won’t bother most people, I think! I have yet to read this one. Dunno about the widow thing. I know two recent widows who just hooked up with men they met over the internet. Perhaps technology will change that statistic. It would have to change the ratio: women’s life expectancy is higher than men’s. Unless that changes, there are always going to be more unattached women at the end of life than men, and partnered women can expect to spend their last years alone. So from a feminist perspective, it’s important that women have a strong sense of their own identity and not in widowhood be in Olive’s position, looking for things to do and joining things for companionship that she never needed before, because she had Henry. I have a number of women friends who are, for one reason or another including by choice, solo, and they are contentedly self-sufficient. They are role models for both men and women in that they live their lives without thinking that coupledom is the norm. Oh, I don’t doubt that,. but at the end of the day there’s going to be more women ‘left over’ than men. I read this last year, and really loved it – ending and all! I loved this book. I read it when it first came out. However I have not read her subsequent books. Frances McDormand (pregnant police officer in Fargo plays her) did a great job portraying her in the mini series I thought. Liked both formats. It is easily a book I could reread again if ever stuck in a cottage on a lake and this is the only book in the house. and neither of these are my cover! I love this book. The amazing thing about it is that each ‘chapter’ is a perfect short story in its own right. When I finished reading it the first time I immediately turned back to the first page and started reading it again. I have never done that before or since. I just had to understand how this collection of stories is a novel. Skillful! I’ve read a few of these linked short-stories-forming-a-novel, and I think this is the best example of its kind. Me too. The short stories disappear in the novel. I agree it is the worst cover. I don’t understand it. It is just does not look like Olive or what she would wear. “The short stories disappear in the novel.” That’s a good way of putting it. It always felt like a novel, even in those stories where Olive plays only an ephemeral role. Oh yes, another book we agree on, Lisa. :-) And I too saw the ending as a bit off kilter but … if she’d never changed a bit in her life prior to this, then finding a new partner was a continuation of not changing. I loved that she finally embraced some love at the end. I like the quiet element of her affair that ended so tragically. After that point, there was almost a void waiting to be filled.